After graduating from the Royal Veterinary College in 2007, Karen travelled to the Cook Islands in the south pacific to volunteer for a charity veterinary clinic for 4 months. 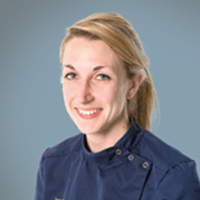 Upon returning to the UK Karen worked in a busy small animal practice in Dorset, for 18 months, after which she moved to SCVS to undertake an internship. This was followed by a 3-year surgical residency at Cambridge Veterinary School. Karen began working at SCVS again in 2014. She then passed her European Diploma in Small Animal Surgery in the beginning of 2015. Harris K, Witte P (2016) How to diagnose cranial cruciate ligament disease. BSAVA Companion Jan 2016.